Things at Disney World tend to be complicated. Advanced dining and FASTPASS+ reservations, choosing the right resort hotel, and even deciding when to visit are just a few examples. Not surprisingly, parking at the “Most Magical Place on Earth” can also be a bit confusing. Guests with Disney Resort hotel reservations made March 21, 2018 and thereafter will have a fee applied to the guest folio for standard overnight self-parking. Complimentary self-parking is still available at the resorts for day guests who visit to dine, shop, enjoy recreation activities, or simply visit the resort for the day. Disney Vacation Club members will not be charged for standard overnight self-parking when staying at a DVC Deluxe Villa, regardless of whether they use vacation points or another form of payment. DVC Members also will not be charged to park when using vacation points to stay at a Walt Disney World Resort hotel. When visiting the theme parks, you pay one fee for a parking pass that’s good all day and at all 4 theme parks. That means If you leave and return to the same park or if you travel to another park, you only don’t have to pay again. Just make sure to keep your receipt! The Disney World parking lots are huge. When you pay for preferred parking, your parking space will be in a lot that’s closer to the park entrance. Aside from a shorter distance to the entrance, Guests in preferred parking also receive free, cold bottled water for everyone in their party. (Note: you may have to seek out the Cast Member distributing water). Regardless of whether you park in preferred or regular parking, there are trams that are constantly in use to get you from the lot to the entrance. You may walk if you prefer it, but trams are available for you. Tram Tip: Strollers do need to be folded to board the tram. Complimentary theme park self-parking is available to registered Guests of Disney Resort Hotels, select Annual Passholders, Premium Passholders and Disney Premier Passport holders. These Guests may choose to upgrade to Preferred parking by paying the difference between standard and preferred parking. Disney Water Parks – There is no parking fee at Disney’s Blizzard Beach or Disney’s Typhoon Lagoon water parks. There are no parking trams either, so be prepared to walk to the entrance. Disney Springs – There is no parking fee for the parking garages or surface parking at Disney Springs. ESPN Wide World of Sports – General parking is free and valet parking is available on select event dates for a fee. In the event the Sports Complex parking lots fill to capacity, guests will be directed to alternate parking locations. If you’ve paid for parking, remember to hold on to your receipt each day for re-entry or park hopping. Follow Cast Member instructions. Disney loads their parking lots in a specific and methodical way. All drivers must follow Cast Member parking instructions. You won’t be able to choose your parking space. Before you board the tram or start walking to the entrance, snap a photo of your row name and number or send yourself (or a member of your party) a text with the parking location. The tram host will repeat the row name and number before the tram pulls away, so you’ll have another opportunity to record your location if you forgot to snap a photo. If you can’t find your car, don’t panic, but find the nearest Cast Member. Security and other Cast Members are constantly patrolling the lots. They can assist you in finding your vehicle. The earlier you arrive, the closer you’ll be to the park entrance. If you tend to walk at a brisk pace, you may find that you can walk to the entrance fairly quickly. In some cases, the tram will sit for a few minutes allowing many guests to board, and walking will actually be faster than taking the tram. Just make sure not to wear yourself out with the extra walking so early in your day. This isn’t for everyone! 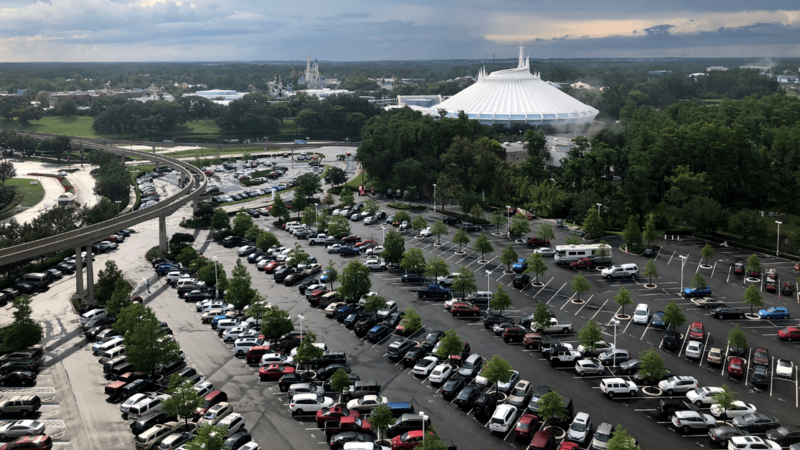 And there you have it, the ins and outs of parking at Walt Disney World!